Located in the Mountain Park Resort area of Pigeon Forge, you'll find this excellent 3-bedroom cabin with all the amenities you need for an amazing getaway to the Great Smoky Mountains! 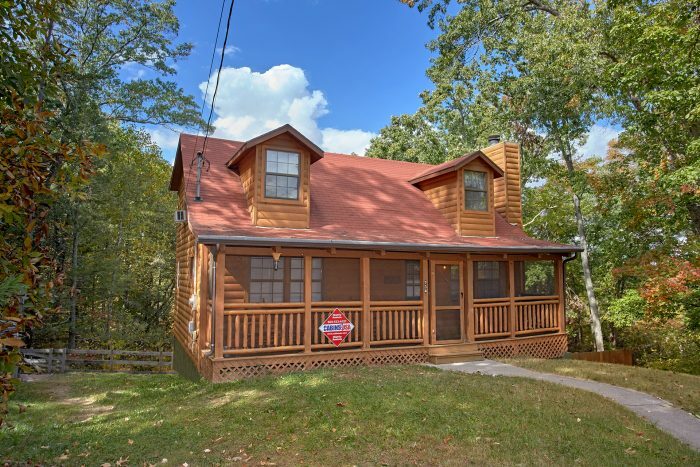 "Wolves Den" boasts a prime location that's only a mile from the heart of Downtown Pigeon Forge. 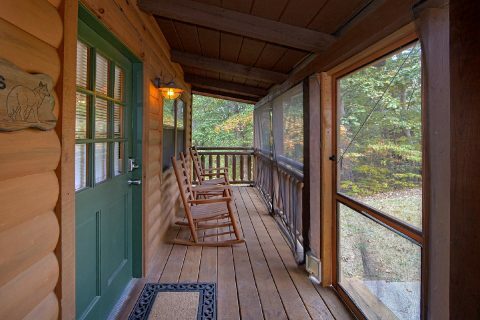 Not only is this cabin ideal for visiting Dollywood, but this cabin's convenient spot also makes it easy to reach Downtown Gatlinburg and the Great Smoky Mountains National Park! 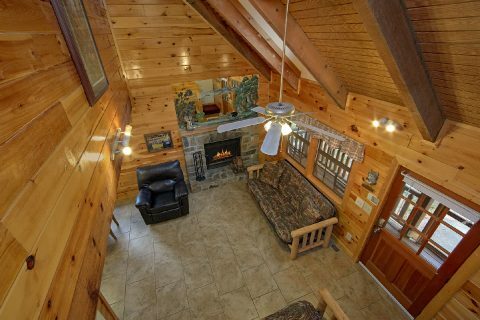 When you aren't out enjoying the best the Smokies have to offer, you'll love kicking back in this cabin with plenty of luxurious amenities. 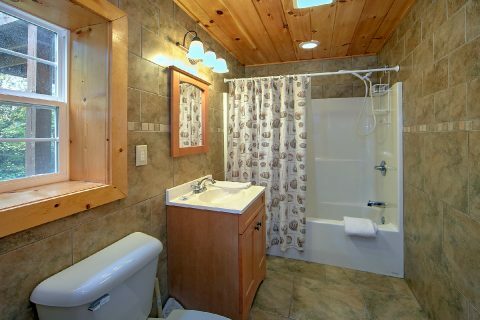 Thanks to this cabin's location in the Mountain Park Resort area, guests can enjoy resort swimming pool access during their stay. 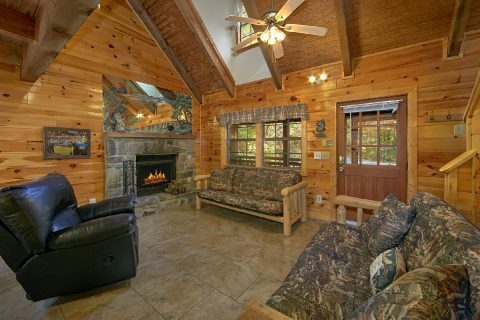 You'll love spending time telling stories around the wood-burning fireplace in this cabin's living area. 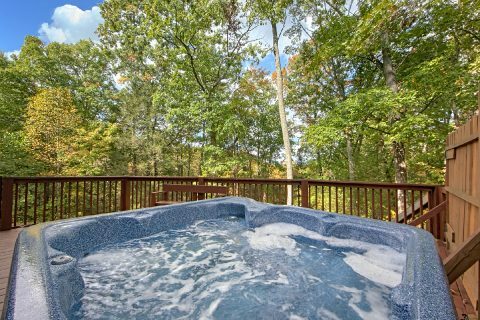 To rest your weary bones, simply take a dip in this rental's 6-person hot tub on the deck. 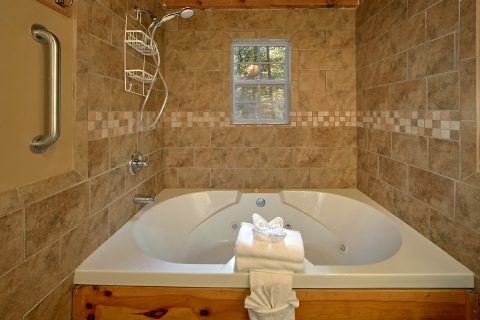 For a relaxing soak in private, spend some time in your rental's jetted jacuzzi tub. 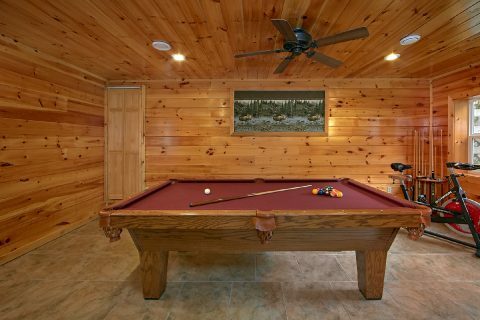 Enjoy a game of pool in the game area. 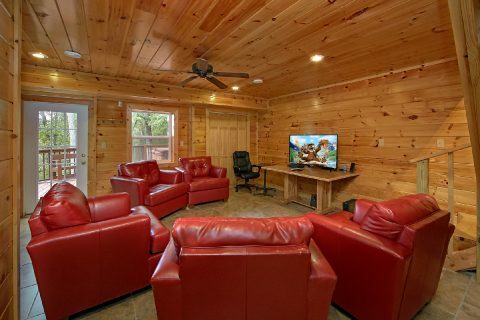 Or you can simply enjoy a laid-back movie night in your cabin in the downstairs theater area complete with a 55" television, surround sound, comfortable seating, and a Blu-Ray DVD player. 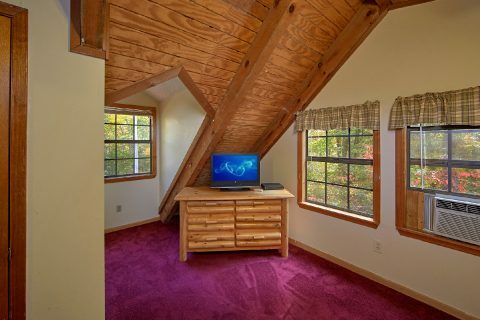 The game room also provides an exercise bike for guests to use. 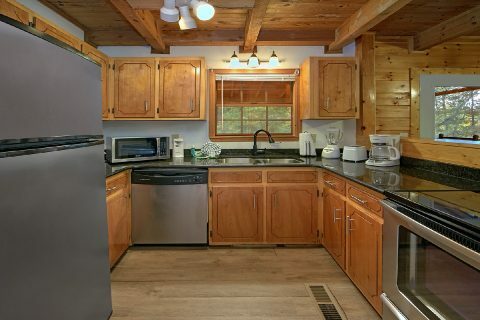 This cabin's kitchen makes it easy to save money on your vacation by giving you the option to prepare tasty meals at home rather than going out to eat every night. 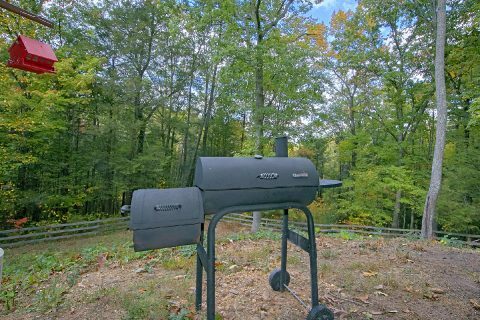 Better yet, this cabin offers a charcoal grill, so you can enjoy a cookout in the great outdoors for your vacation in the mountains. 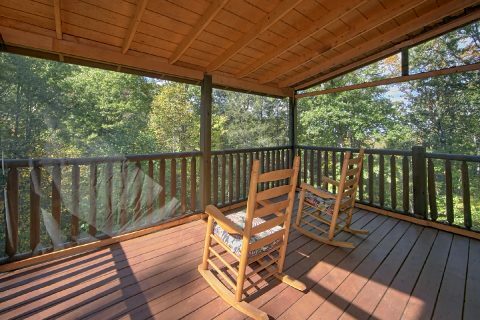 This rental also offers a screened-in deck to keep nature's pests at bay and a fenced-in back yard. 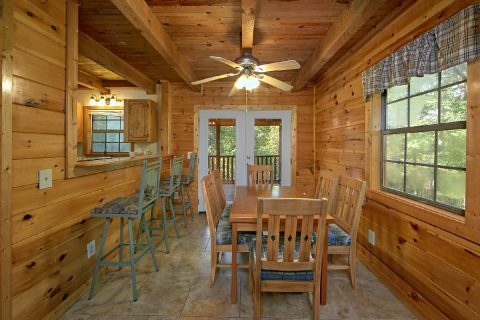 Lastly, this cabin offers wireless Internet access so you can share pictures of your Smoky Mountain adventures with friends back home! 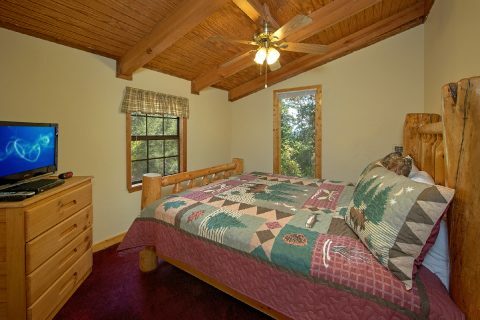 For staying well-rested on your vacation, this spacious cabin offers 3 bedrooms: 2 with king-size beds and 1 with a queen-size bed. 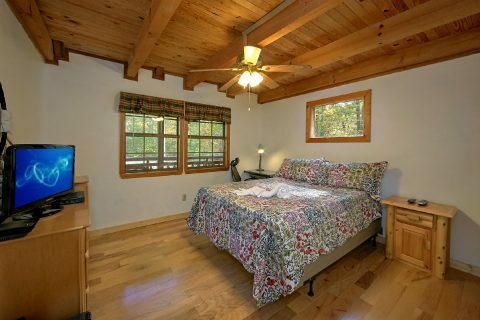 All of these private bedrooms come complete with private televisions. 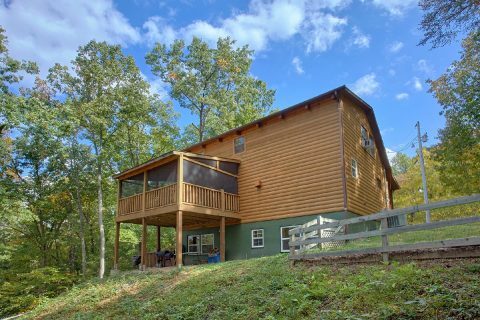 Additionally, a sleeper sofa in the living room and a futon in the game room provide extra space for guests, so this cabin can accommodate up to 10 vacationers. 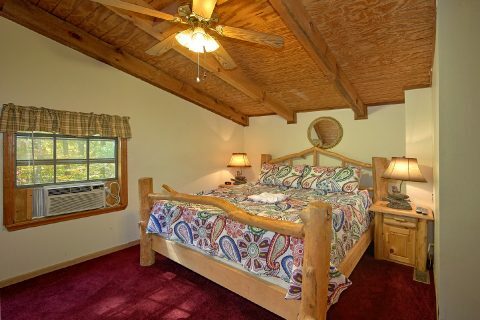 Book your cabin online today with Cabins USA Gatlinburg to earn a discount on your stay!